Only VA campground with waterfalls, indoor hot tubs & tame Bunnies. Family owned for 40 yrs. Offer River Tubing, Fishing, Cafe/Pizza Shop, Cabins, On-Site Rental Campers and Weekend Entertainment. See y'all soon! We stayed here for our 30th wedding anniversary. We brought our motorcycle in our Toy Hauler to ride the mountains. When we checked in, no one guided us to our campsite, we had spot 89. It was a 50 Amp full service site. Getting to the site was a challenge, the spaces are tight and the roads were narrow with some vehicles sticking out into our path navigating to our spot was tricky. The posted speed limit was 5 mph but golf carts were running around the campground at 15-20 mph. When we arrived at our site, we noticed a large power transformer took up half the area under where our awning would be coming out. No one mentioned site 89 had a large 4' x 4' power transformer located on the site. In addition to that, on the left side of the site, there was a large area where the power went into the ground. When I connected my freshwater hose, the faucet threads were stripped so I had to find another faucet. We connected our cable but the cable didn't work. The Wi-Fi code didn't work when we tried to use Wi-Fi. The rules stated no Fireworks but people were lighting off Fireworks on 5-7 July. The rules stated no alcohol at the pool but people were at the pool drinking from beer cans in the open. Quite hours were suppose to be observed at 11:00 pm but peole were naking noise well past 11:00 pm. Rules said to not burn trash in the fire-pits but we saw several people burning trash in the fire-pits in the morning and the staff rode by in golf carts and didn't say anything about it. The Men & Ladies bathrooms had dead flies on the floor and the soap dispensers ere empty. We picked this campground because of its location to the mountains. In the mornings when the staff was riding around the campground, they never once said "good morning". I can say we will not be back. The staff was friendly and our spot was pretty wide, which was nice. The restrooms are a little dated and their is no place to put your soap and shampoo when you shower. Wifi is non existent, not even in the office, so if you are thinking they have wifi, they do not! Also, if you like TV, the cable is spotty at best, luckily, I don't watch TV but hooked it up for my dad. I unhooked it after a couple of days as the signal was to weak and their was a lot of pixeling. The pool is large and the tubing down the river was fun. Overall, the park is average, definitely not for big rigs as their are only handful of 50 amp sites. Nice campground but very crowded. Beautiful scenery, especially the water fall, along the river. The pool was fun, it is big and comfortable with plenty of seating around the deck. The bathrooms were rough, a lot of usage and a lot of flies due to the doors being open. Getting out at the end of the stay was difficult due to the number of campers visiting the dumping station. Even if you are not using the station, your exit may be blocked due to the line waiting. We may stay again due to the convenience of where our weekend activities were and will be again. just wish it had more room. We loved this campground! There were so many things to do. It was to bad for us that it was only an overnight stop. We didn't use the restrooms so I couldn't rate them. People were friendly, kids playing, riding bikes and just having good old fashion fun. We stayed Shenandoah Valley Campground the first weekend in June 2017. First the good...the campground has several activities (karaoke, dj, fishing, corn hole, horseshoes, playground, pool, putt-putt-there was a charge to play putt-putt, not sure about corn hole and horseshoes) that are available. Most campgrounds don't have nearly this many activities. They also have tame bunnies all over the place, which was really cool. I did not use their restroom facilities, so I cannot attest to the condition of those. Other than the slobs who felt like it was ok to throw their drink bottles and candy wrappers on the ground with their parents RIGHT THERE, the campground was clean. There are ample trashcans that are emptied frequently. Now, the bad...The RVs are packed in like sardines in a can. I can't remember when I have been to a campground where we were so close to our neighbor. There was shade, which was good, but trying to find a good spot to build a fire so 4 people could sit around the it was challenging. The other complaint...don't say that you offer free wifi if it isn't usable. Yes, we could connect to their router, but that was about it. We could not get out on the internet to look up any local attractions or restaurants. We have Verizon for cell service which is usable just about everywhere, but not there. I know that you are supposed to camp to get away, but we run our own business and need to be connected when we are away from the office. This is a happy place. Maybe it's the floppy eared bunnies hopping around, cheerful staff, or beautiful setting on a river with a verdant green hill above. Nice pool, and they offer family activities on weekends. Some sites are not so level but we found a good one along the river. WiFi is very spotty and tends to drop off. But otherwise a very nice place to stay. Best I have found along this stretch of I 81. Great campground, very relaxing yet plenty to do and see in the area. Great staff and facilities. Grand Caverns nearby must see. Friendly staff and overall good facility. The only issues we had were the poor quality wifi and lack of cell signal. If you rely on either for internet access this park is not for you. A great place for beginners. Staff was very accommodating to all our questions and helped us get hooked up the right way. Area was clean and quiet. Staff was VERY friendly and helpful. Had some issues with WIFI and TV but overall a great and relaxing time spent. Rabbits and waterfall were a great addition to our stay. Will definitely return again. This park aims to keep you occupied... tame bunnies, streams, tubing, swimming pool, evening dance (during our stay), hot tub, and more. The grounds provided ample walking areas, the staff is friendly, store is open long hours. 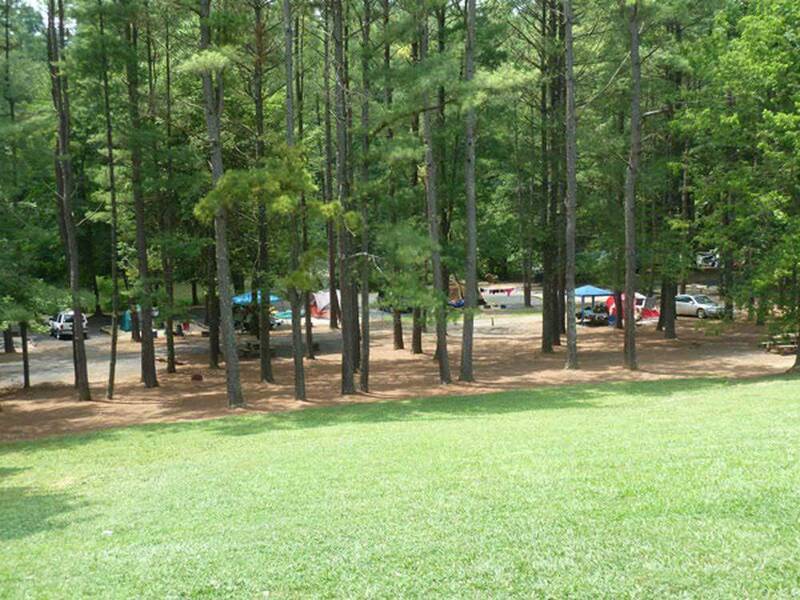 With 132 RV sites, 10 rental RVs, cabins, and tent sites this is a large facility which could be busy on the weekend. The staff is constantly checking/cleaning the bathrooms. The only negative is when the campground is full the sites might be cramped; however, on our visit it was about 1/2 capacity with ample room. Great place to stay. Really enjoyed it. WIFI a little iffy at times. We had a pull through site that was shady and level. The staff are friendly and helpful, even stepping in on my last afternoon when I inadvertently locked myself out of my coach. The campground had entertainment Friday and Saturday evenings and nondemoninational church services Sunday morning, as well as an available breakfast that morning. There are many amenities for adults and children, including a swimming pool, hot tubs, a game room, miniature golf, horseshoes, volleyball, a bounce pad, and playground equipment. There is a population of bunnies that one can feed, but may prove a challenge for one's dog. There is a fishing pond. The Middle River borders the campground that one can tube with one's own or with a rental. Daily my Labrador enjoyed a morning plunge in the river on a retractable leash. With permission, twice a day she got to play fetch at the upper hill field. We had such an enjoyable time that we plan to return next summer. Great place with lots to do. Heated pool, fishing and tubing on the river plus karaoke and dancing in the evening. Have been there a few times. Lots of fun.